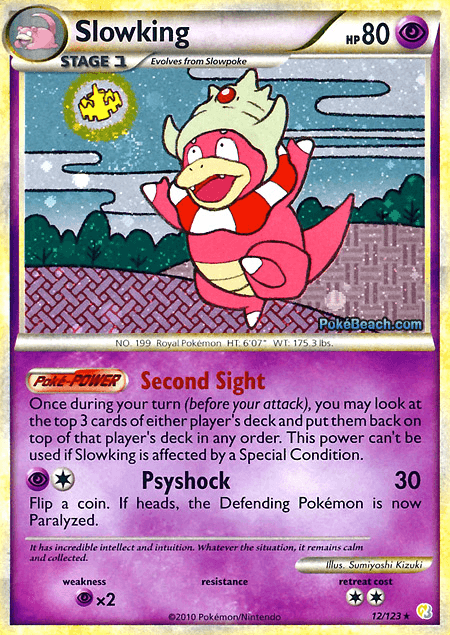 PokeBeachIn an effort to speed up the COTD releases, I decided to write one about one of my favorite disruption cards: Slowking. It also reminds you of Ralts’ (PL) “Future Sight” attack, huh. Only this is much better as it’s a Poké-Power. Slowking would be a nice addition to any Trainer Lock deck, including VileGar, LockChamp, LostGar (w/ Vileplume), and much, much more! And not to mention all disruption-based decks a.k.a. Sablelock, Chenlock, and ?? ?lock (<— any lock deck). Unfortunately, it is Garchomp C bait, so you’ll have to be tricky. Maybe you should try this card with a high-hitter, such as Gyarados, who can one-shot (with an Expert Belt) Garchomp C Lv.X. Or maybe (like I suggested above) VileGar, who can also easily one-shot Garchomp C Lv.X, and even the occasional Palkia G Lv.X, another sniper. I would not underestimate this guy’s power. Next format, even with Garchomp C in the metagame, we will definitely see more of this card being played, as Power Spray will be gone (both “YES!! !” and “Awww…” … I have mixed feelings about seeing Power Spray, the king of disruption, go). 4.5/5 is really high, I’d rate Garchomp C “LV.X” 4/5. Very nice analysis though. I absolutely love this card, it seems so underplayed to me. Gotta get it in a deck soon. I’ve never seen this card before but this one is a good addition to anyone’s deck (except for Czard and some decks that has their engine already) becauseit has many uses in manipulation. 4.) Its a stage 1 pokemon and can be accessed easily with today’s format. I was thinking to do my first Cotd on this card but I guess that you beat me to it! Great one though.